47/48 Les Winan The Punisher: Punishing. Well, they got the look of the character in "costume" right...aaaaand that's about it. John Travolta may be the worst actor alive. 63/126 Kim Hollis A surprisingly solid vengeance flick. The Punisher is one of the most influential mainstream comic book characters ever created. The character’s arrival in the '70s helped usher in the era of the Anti-Hero. The violent and merciless nature of the character quickly turned him from a villain into a hero that readers had never come across before. The character was too popular for his own good. Capitalizing on the popularity of their new hot character, Marvel comics was shipping out three or four Punisher-led books every month and included him in other monthlies whose sales were sagging. The character lost his appeal and soon faded from the mainstream. Zoom to 2001, when the critically acclaimed creative team of writer Garth Ennis and artist Steve Dillon, fresh off finishing up their run on the adult comic book series Preacher, gave Frank Castle new life. The character had once again found his voice in the comic book world and was now gaining popularity alongside such long-standing characters as Spider-Man, Daredevil and the X-Men. With comic book characters being the hottest properties in Hollywood, The Punisher was destined to have a big screen adaptation. Enter Jonathan Hensliegh, a proven writer who had worked on big-budget action films, including Die Hard with a Vengeance and Armageddon. Artisan Entertainment signed Hensliegh on to direct from his own script. 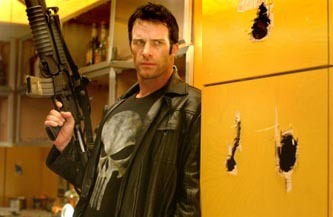 The studio then proceeded to sign Thomas Jane in the lead role. Jane, an up-and-coming young actor who is probably best known for his lead role in Deep Blue Sea and supporting roles in The Sweetest Thing and the underrated baseball drama 61, was certainly a bold casting move for Artisan, who then went on to cast John Travolta as Howard Saint, the villain of the piece. Rounding off the cast are Ben Foster and Rebecca Romijn-Stamos, who must be delighted to be in a comic book movie that doesn’t require her to go through five hours of make up every morning. The film will reportedly stick closely to its source material while focusing heavily on the Ennis/Dillon stories. The story of Frank Castle begins close to the end of his successful career as a police officer. A few days away from retiring to a desk job, a move that will allow him to spend more time with his family, Frank is targeted in a mob hit and his wife and child die. Castle then spends the rest of his life relentlessly hunting down and killing criminals. His vigilante life makes him the target of the police and eventually the FBI simultaneously becoming the most wanted man in America and the man most feared by criminals. With the new trailer debuting recently, the hype for The Punisher has begun. What is intriguing about the film so far is it seems to be a throwback to old school ultra-violent action films. This is probably a result of the modest budget of the film, nonetheless, it is refreshing to see that it won’t be relying on heavy CGI and too much eye-candy. At the same time, this puts pressure on the movie to deliver. After all, if you’re not going to blow people out of the water, you have to give them 100 minutes of solid entertainment. But can any action movie, whether a throwback to '70s and '80s actions films or a contemporary special effects extravaganza, survive when John Travolta is chewing up the scenery as the main villain? Not that Travolta isn’t still a star, it’s just that he’s become a cliché of himself, much like Al Pacino after the release of Scent of a Woman. He really has to tone his performance down or the quality of the film will be threatened.